Saltaire Village01274 433678work TownSaltaire is a UNESCO World Heritage Site, thanks to its preservation as a Victorian industrial village. Mill owner Sir Titus Salt built the village for his workers and today Saltaire attracts millions of visitors to its magnificent architecture and visitor attractions. 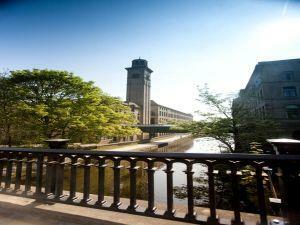 Today his great mill complex is the key feature of Saltaire and houses the 1853 Gallery. Here you will find one of the largest collections of art by renowned Bradfordian David Hockney. There are also several cafes and restaurants in the mill as well as independent shops, including Home which sells designer homeware. Opposite the mill is the Saltaire United Reformed Church a grade I listed building and one of Britain's most precious Victorian architectural treasures. The church is the resting place of Sir Titus Salt. The village of Saltaire also has good restaurants, cafes and interesting shops as well as interesting events programme. Don't miss the Saltaire Festival in September; two weeks of live music, markets, exhibitions, performances and culture. Nearby you will also find the Leeds Liverpool canal which is ideal for a pleasant stroll. Or alternatively take a walk through Roberts Park to Shipley Glen Tramway. Saltaire is a UNESCO World Heritage Site, thanks to its preservation as a Victorian industrial village. Mill owner Sir Titus Salt built the village for his workers and today Saltaire attracts millions of visitors to its magnificent architecture and visitor attractions.